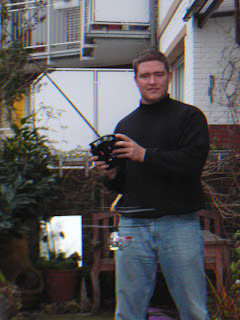 So, I finally succumbed and did what every man does in his life (except quiche-eaters): Get a remote-controlled helicopter. It really is rather difficult to get the hang of it - helicopters are inherently unstable (while fixed wing aircraft are mostly inherently stable). The salesman demonstrated it to me briefly, and flew and controlled it effortlessly - I dare say he had practiced quite a bit. I've crashed it several times already, but so far it survives (I've fractured a few blades, but it does come with spares). Great fun. Please accept with no obligation, implied or implicit, my best wishes for an environmentally conscious, socially responsible, low stress, non-addictive, gender neutral, celebration of the winter solstice holiday(tm), practiced within the most enjoyable traditions of the religious persuasion of your choice, or secular practices of your choice, with respect for the religious/secular persuasions and/or traditions of others, or their choice not to practice religious or secular traditions at all. Furthermore, I wish you a fiscally successful, personally fulfilling, and medically uncomplicated recognition of the onset of the generally accepted calendar year 2007, but not without due respect for the calendars of choice of other cultures and without regard to the race, creed, colour, age, physical ability, religious faith, choice of computer platform, or sexual orientation of the wishes. What every man ought to do was published on December 24, 2006 .